What is the ideal freestyle stroke? Can you spot it when watching other swimmers? The fact is, there is no perfect stroke, but there are techniques that can make you a better swimmer. Are you ready to swim faster and more efficiently than ever before (unless you’re a professional or former Olympian)?! We’ve added 27 NEW videos to our popular 15-Part Video Series and Training Plan, “How To Swim Faster in 30 Days: A Freestyle Guide to Dropping Time,” for a total of 42 instructional swim lessons and demonstrations. This program NOW includes nearly 2 hours and 30 minutes of video instruction! Each new order comes with a $47 off discount code on orders of $150 or more on blueseventy.com! Join Coach Wendy Mader and Dave Erickson for a detailed 30-day training plan and more than 40+ videos designed to help you swim faster and more efficiently than ever before! 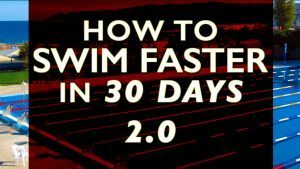 “You asked if I swam faster after “Swim faster in 30 days“. I got sick half way through so I had to stop for 3 weeks. I just picked it again after I got better. Probably not the best way to do the program.